Lens Description: A telephoto zoom offering the most frequently used telephoto focal lengths, equivalent to 76mm* to 213mm*, and a maximum aperture of F2.8. It features the latest technology, including dust / water and low temperature resistance, a triple linear motor, and the world's top image stabilization technology in its class, so that users do not miss a shot in any conditions. Its advanced performance makes it a perfect choice, not only for portraiture and snapshots, but also to capture fast-moving subjects in sports or wildlife photography, and for general outdoor nature photography. The review, above, has a typo or mistake. 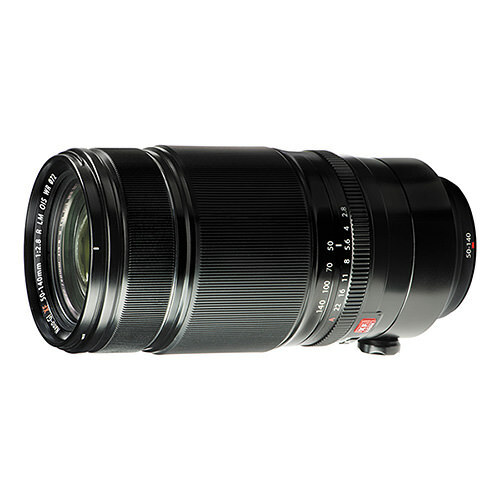 I own the lens and have been considering the Fujifilm XF 1.4x TC WR Teleconverter. It certainly is and I use one a lot. Frankly up to size A3 prints and using a loupe I cannot detect any discernible drop in Lens quality using the TC even at f2.8/f4.0. A great Combination giving almost a 300mm f4.0 equivalent lens and used with my XT-2 and Motor drive it’s well balanced and easily hand held. I own this lens, and purchased it for my first Fuji Camera, the X-T3.. It is a superb lens. Solidly built, almost silent in operation, I say almost, but to be honest I have yet to use it in a situation where I have detected any noise, and I have very acute hearing, even if shooting video (see below). The image quality is first class. A bit about me, I was born in 1954 when 100% O2 was pumped into baby incubators, before it was realised that this could lead to blindness, and aged eleven I was diagnosed with extreme myopia, or short sightedness. This was directly attributed by an Ophthalmic surgeon to the use of 100% Oxygen. In my 50‘s I developed cataracts, again possibly due to my experiences as an infant. My lenses were replaced and I literally cried with joy at the colour and detail I could then see. Not surprisingly I look for that crispness, detail and colour rendition in my images, and this lens has not disappointed. One has to remember that the focus selector button is on the camera body, or one can be disappointed on those occasions where one forgets, but that is not the lens’s fault. I have the 1.4x converter, they work well together. Only this week I shot 4k video on my X-T3 at the coast, and got enough footage to make a short film featuring the photographers I was out with that day. I am very pleased with the results. Apart from occasional jerks, again my fault for forgetting my tripod mounting plate which screws onto the lens mounting foot, giving a lovely balance, the lens-even though it was hand held, provided some very smooth pans given its handling characteristics. I recommend the 50-140 unreservedly. I am a proud and very satisfied owner of this premium quality product.